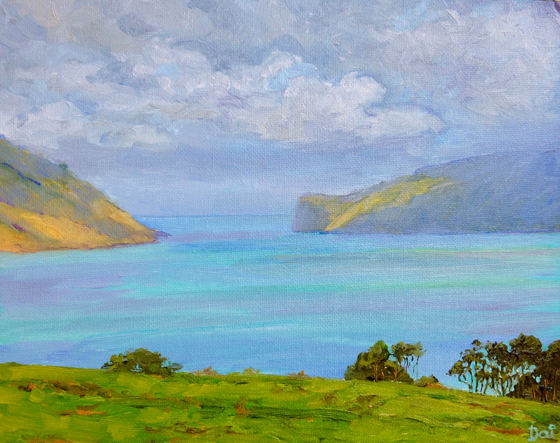 Not an approaching storm, but late afternoon sea mists rolling in from the Pacific Ocean at the entrance to Akaroa Harbour on the Banks Peninsula in New Zealand’s South Island. I was amazed at the wonderful shades of turquoise and aquamarine, interspersed with mauve, purple, blue and green of the shallows, sand banks and reefs. The setting sun highlights the dry grass on the harbour heads. Oil painting by Dai Wynn on canvas panel. 20.3 cm high by 25.4 cm wide by 0.3 cm deep approximately. (8 inches by 10 inches). 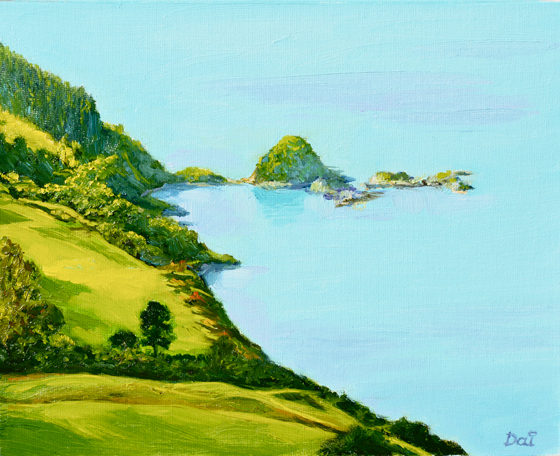 Looking down on prime farming country at Wainui and a small archipelago of rocky islets on Akaroa Harbour, Banks Peninsula, near Christchurch, South Island, New Zealand. No, this is not a manicured golf course, but typical grasslands for sheep and cattle. Oil painting by Dai Wynn on canvas panel; 20.3 cm high by 25.4 cm wide by 0.3 cm deep approximately. (8 inches by 10 inches).